Streamlined UI, attached media on top and tasks both pending and completed below. Imagine you just shot that once-in-a-lifetime take, only to realize back at the hotel that every file from your backup drive is corrupt or missing and the original media has been reformatted multiple times since then. You might have experienced this kind of scenario once. Hopefully only once, because from that point on you would install some kind of professional backup software for offloading your footage, right? Silverstack Offload Manager is exactly that: A professional software for backing up data to multiple destinations, complete with dedicated verification and reporting. It uses the same core engine as the full Pomfort Silverstack suite of applications, trusted by professional DITs for years. While designing Silverstack Offload Manager, the goal was to create a streamlined and easy-to-use, yet powerful and trustworthy companion for creating backups of footage on set. The interface is pretty much self-explanatory: Choose your source, select one or more destinations, done. The underlying Silverstack copy and verification engine takes over and does the heavy lifting for you. It’s a two-step process and each step is clearly visible within the user interface: A blue checkbox indicates a completed copying process, the green checkbox next to it gives you some peace of mind, due to the successfully completed verification process. All kinds of camera formats, including RAW sequences as well as photos, sound files, and other production documents are being supported. Furthermore, the software automatically creates comprehensive offload reports to document all copy jobs for that given day. In terms of data verification, the Silverstack Offload manager relies on the company’s proven verification engine, which sports checksum methods such as xxHash, MD5 and SH1. According to Pomfort the copying process is as fast as using the Finder (on a Mac). The only thing that takes a little bit of extra time is the hashing process for verification. Multiple sources from different USB / Thunderbolt ports or card readers can be copied to multiple destinations at the same time. The app takes care of balancing the load across all tasks. 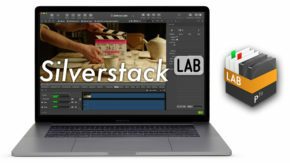 In addition to just copying files, Silverstack extracts all of the camera’s metadata in the background, offering you the possibility to export your project to Silverstack XT or Silverstack Lab, in case you need to further work on that footage before entering post production. That very metadata is also being used to create not only comprehensive but human readable reports. The software recognizes the camera, the format, things like color sub-sampling, frames per second and other very useful metadata. Just like Silverstack XT, all kinds of camera makes and models are being supported: From GoPro all the way up to Alexa LF. Offloading camera footage safely is a very important part of acquiring footage and you really should take it seriously. Back in the days, we had film reels or video cassettes. These were kept and archived so no real backup was needed. Now we have SxS cards, SD cards, SSD drives, CFast cards and whatnot. All these media share one thing: They are intended to be used over and over again. You will format them and reuse them in-camera. 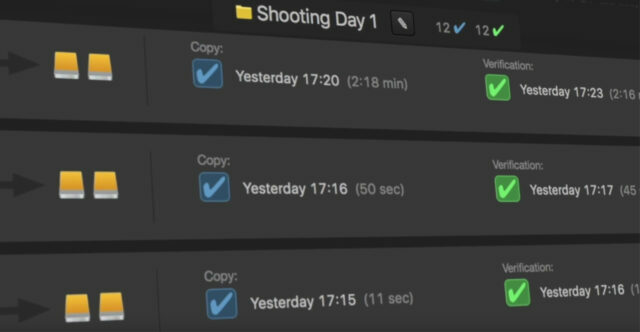 You probably will do this on set, so you’ll really need a secure and trustworthy backup and verification solution in order to safely transfer all of your footage into post, as opposed to ending up with missing and/or corrupt files. There are lots of backup solutions out there. 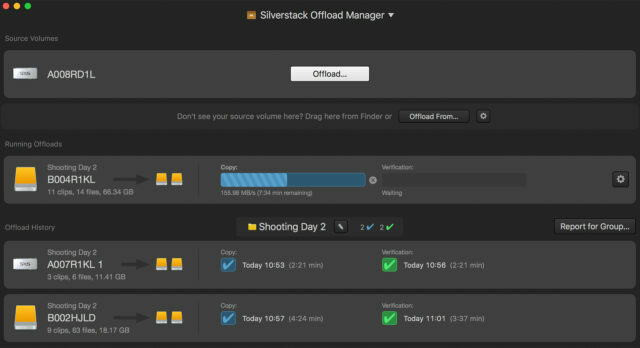 The Silverstack Offload Manager clearly aims for those more affordable one-purpose solutions such as RedGiant Offload or Hedge. Both are available for around a $100 and for that amount they are yours to use and keep. Silverstack Offload, on the other hand, relies on a temporal license model (one year, one month or 14 days). That might seem expensive, but since you have the ability to export projects from Silvestack Offload Manager to the more advanced apps, it integrates nicely into existing DIT workflows. This is something the others do not offer, so you’ll have to decide if you need that kind of flexibility. All three competitors offer multiple backup destinations and checksum verification, so all three are way more secure than just copying over some files via your operating system’s file manager. Pomfort’s Silverstack Offload Manager is available as a 1-year license for $139 (119 €), or as a project license: 14 days for $35 (29 €) or one month for $49 (42 €). You can activate each of these licenses on the exact day you’ll need them, so you won’t waste any days if you buy a license in advance of an upcoming project. If a given license has expired you’re still able to open existing projects in read-only mode. A 10-day free trial version is available for download. Do you use some kind of backup software while on set? What do you think of this new Silverstack Offload Manager? Share your thoughts in the comments below! I have Shotput Pro 6 for Mac which cost me $129.00, a one time fee. While the this Pomfort software seems cool, other than if I had to interface with DITs (which I don’t), what does it offer than Shotput Pro 6 doesn’t? Seems like over a few years, Pomfort’s software would cost me a LOT more and I can’t see a compelling reason to pay more for it?